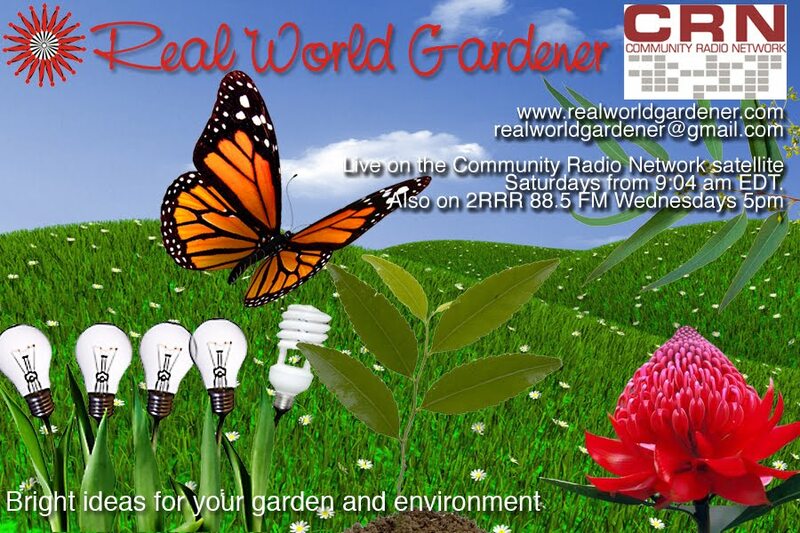 We’re focusing on fungal diseases that lurk in the veggie patch in Plant Doctor, are there solutions for deterring possums in vegetable heroes, a new series on garden styles in Design Elements and today is what makes the Federation style and what is Hypericum in the Talking Flower segment. 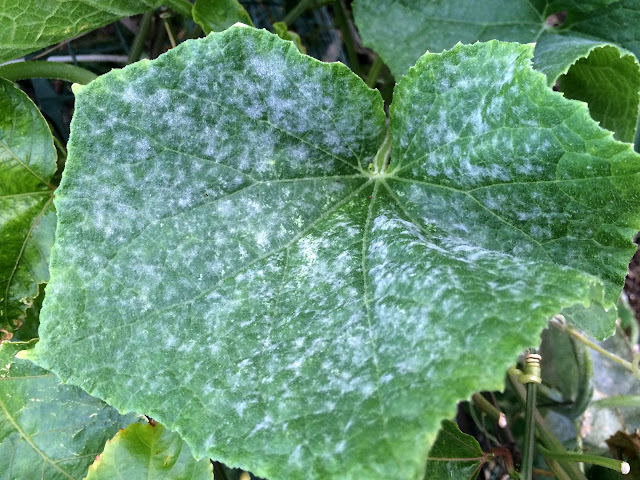 Fungal Problems of Cucurbits: Cucumbers, Zucchini, Squash, Pumpkin, Watermelons and Rockmelons. You might think that it’s only hot and humid weather that brings out this particular fungus to the fore. But no, not only is this fungal problem not host specific, but it can blight your plants, both edible and ornamental during a wide temperature range. Powdery mildew is the main fungal disease affecting cucurbits. It looks like a white coating over the leaves and stems of the plants. Powdery mildew has an effective temperature range of 10 – 30 C and can attack just about everything in the vegetable garden as well as your annual flowers or perennials such as Dahlias. Preventative spraying is best if you have it year after year especially as spores can germinate in some districts all year round. There’s plenty of preventative treatments, some homemade, others commercial. Full cream milk works best in sunny weather. Bi-carbonate of soda works reasonably well. Sulphur can be used but it will burn the plants on hot days and also kill off any beneficial insects. 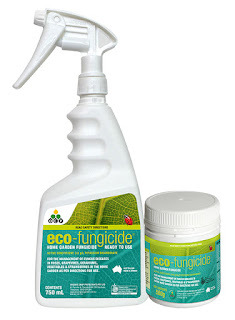 The best solution is Potassium bi-carbonate which is sold as eco-fungicide. 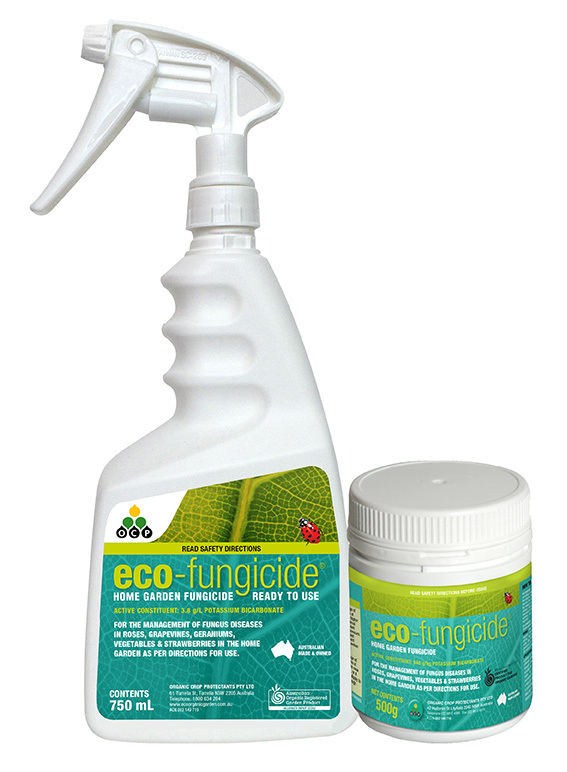 Under a microscope, potassium bi-carbonate affectively kills off the fungus in 5 minutes. You may find that rotating your choice of treatment gives you the best results with this fungal problem. I thought this segment could be about what people thought worked in their garden to deter possums. Are you plagued with larger critters making a meal out of your vegetable garden, roses, ornamental shrubs, the list is endless? Perhaps you’ve tried hanging some blood and bone in old stockings around your plant in the belief that possums hate the smell? Maybe you tried mothballs instead of the blood and bone. What about sensor spotlights? Did you try that? Gardens don’t even have to be big because courtyards aren’t immune either, especially if you’re growing strawberry plants, and other delicious veggies. Some suggest decoy plants, and then there’s the ultimate netted off area. I have battled with possums eating our eight ornamental grape vines that cover our pergolas the last two years. Since our last dog passed away. I have tried everything, and I mean everything. Some things work for a couple of days, some not at all. I have now completely netted them in the hope that they will be able to stand a fighting chance of getting some leaves this year. 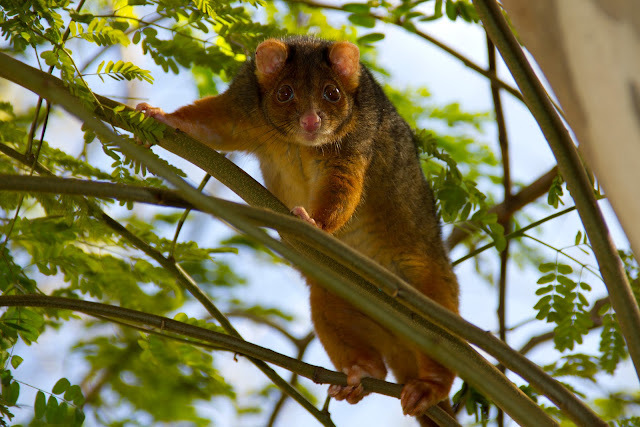 The possums are not interested in the leaves once they are older only when they are new shoots. My question is though are there any really prolific vines, suitable to grow on a sturdy fence that possums absolutely love. I have decided that possibly the best thing to do is plant something that would entice them to not even come near the house. I have three of our forty acres fenced and gardened, so could put it a fair distance away from the house. My husband wouldn’t allow wisteria, we have had a really bad experience with one in the past. I am located around Moruya south coast NSW, we can get a few pretty harsh frosts in winter, had a couple of -3 this year but I could plant in a fairly protected area also. Banksia roses are a good suggestion here. The best suggestion was to instead have big plastic rings/“tubes” around the legs on the pergola and the vine verticals so they can’t climb up. It’s the only thing that has allowed some leaves to grow on the vine. Has to be incredibly tight though. If there's a little gap would squeeze through. 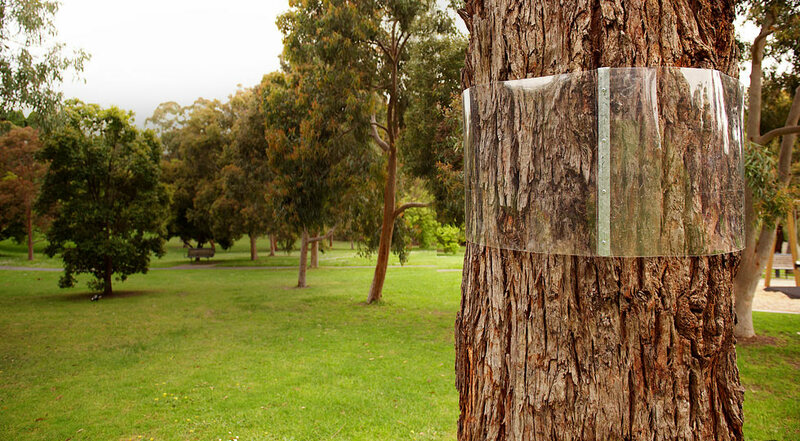 Royal Botanic Gardens Sydney use this method to protect their trees that resident possums like to eat the leaves of. We tried supersonic antipest devices. Absolutely no effect. There are sprays which claim they keep the possums off, that work for a few days but as soon as there’s rain or dew, they have to be re-applied. There are those who leave out food. Denise says she leaves a plate of food out for them. She buys buy cheap fruit an vegs for my lot and a slice of stale biscuits and bread, , they love it and leave my plants alone, they love watermelon but not rockmelon. She goes on to say “i have 7 coming and going ,never have they eaten any of my plants, they know where i put food out, i never had them not eat what i put out only the rockmelon. They eat my bird seed, chook food and cat food dry if i forget it out on balcony. Denise always leaves water out also, the ringtails eat the berries on lilly pilly but she hardly sees them they are so quiet. “I want to share with you a fantastic night pest deterrent - mainly possums but it may work also with rats. We tried many other deterrents for 2 years with little to no success. There are so many poor products and they don't live up to the hype.! We've had a serious issue with possums and as we live adjacent to bush, catching them is unrealistic as new families just move right in! I came to the conclusion that the alternating flashing of SOLAR string Christmas lights would probably be very annoying to the lovely little protected critters : as they are nocturnal and shun lights! And to their delight, it IS ! They cost nothing to run, being SOLAR! Each string is 20m long. They sell them for around $20. Great hisses of disapproval from our possum terrorists for a few nights and since, nothing !! A good 12 weeks later and my roses are growing again and climbers have started to recover. We had landscapers cut 3 terraces into our very steep block at the rear, connected by wide steps. If fence tops are not applicable to you, solar lights could be strung across tops of stakes, or just through the affected areas of your garden. Our garden has 100's of roses, and includes an orchard, vegetable and edibles. All are now thriving ! We use LYTWORX LED 8 function solar lights. Rectangular box. Order them in if they are out? Bunnings was our source. Federation architecture is the architectural style in Australia that was mostly seen from around 1890 to 1915. Most listeners would know that the name refers to the Federation of Australia on 1 January 1901, when the Australian colonies collectively became the Commonwealth of Australia. Gardens used to be much bigger than they are today and during the evolution of the Federation garden, there were probably more plants available to buy than there are today. Federation architecture embraced Australiana themes and of course the verandah. Features might include stylised images of the waratah, flannel flower or Queensland Firewheel tree. Palms, Pelargoniums, Quince, Roses, Succulents and cacti, Wisteria. Gardens also included themes such as succulent, cacti or orchid gardens. In the garden also there was a change from evergreen to deciduous trees such as jacaranda, flowering plum and peppercorn. Hypericum, is derived from a Greek word meaning "over an apparition." Did you know that the Anglo-Saxon word "wort" means "medicinal herb." ? Common St. John's Worts are a creeping rhizome that spread quickly. 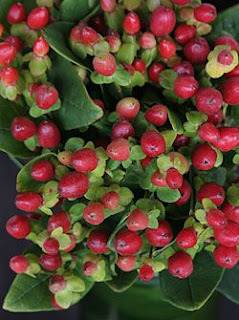 Hypericum berries are used as a filler in cut flower arrangements to add contrast. Be sure to ask for some if they take your fancy. Ms Hypericum is a waterholic because of the woody stem, so make sure the water stays topped up in the vase. Lasts for up to 8 days in the vase. The entire plant, particularly its round black seeds gives off a slight turpentine-like odour. This flower is often associated with cheerfulness and inspiration. Hypericum may also be given to those starting new paths in their life.